The initial idea to build a rescue centre for wildlife near the temples of Angkor originates from a dedicated Cambodian Biologist of international reputation, Sam Veasna. Not only did he intend to build facilities for confiscated wildlife, but he knew from his own experience about the importance of raising awareness of conservation and environmental issues and of educating villagers and forest officers. Unfortunately, Sam Veasna died of malaria in December 1999, after an expedition in search for the last surviving Koupreys (Bos sauveli). However, despite his untimely death, Sam Veasna’s vision of a nature conservation centre persisted. Different NGOs were asked for assistance, amongst them Münster Zoo and the Zoological Society for the Conservation of Species and Populations (ZGAP) in Germany which granted support for the project. Shortly afterwards, the director of Münster Zoo, H. Jörg Adler, travelled to Cambodia to take up first negotiations. In August 2001 and January 2002 respectively, the project manager Kai-Olaf Krüger and the veterinarian Isabell Stich moved from Germany to Cambodia to locate a suitable site for the centre. Some 25 hectares of land could be found at the base of the mountain Kbal Spean, 40 km north of Siem Reap, and use of the premises was granted in May 2002 through a Memorandum of Agreement with the Ministry of Agriculture, Forestry and Fisheries. 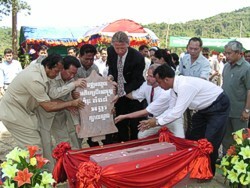 The German nature lover Dr. Stephan Goetz decided to grant the main financial support for the project, enabling the ceremonial laying of the cornerstone and the start of construction in April 2003. At the beginning of 2004, the building of the education centre started. Furthermore, enclosures for mammals, birds and turtles, a quarantine facility with veterinary surgery, as well as two residential houses with offices and store rooms were completed. 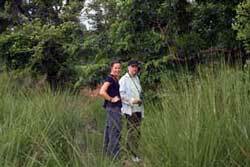 In January 2007, the Colombian biologist Isadora Angarita-Martínez and the German biologist Markus Handschuh took over the responsibility for the operation and further expansion of activities on site. At the expiration of her contract in December 2009, Isadora left ACCB and Markus took over the function as project manager. He was supported from March 2010 until May 2012 by Alistair Mould as Deputy Project Manager. Since May 2012, the project is managed on site by David (Dave) Ware, who is supported by the deputy project manager Lara Rogers.